This beautiful cosmic cloud is a popular stop on telescopic tours of the constellation Sagittarius. Afer all I'm also Saggy only and equally handsome ;). 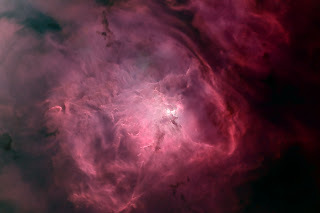 Eighteenth century cosmic toyurist Charles Messier cataloged the bright nebula as M8, while modern day astronomers recognize the Lagoon Nebula as an active stellar nursery about 5,000 light-years distant, in direction of the center of our Milky Way.